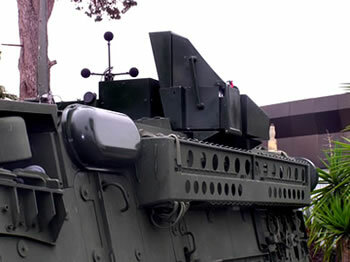 The Trophy Active Defense System (ADS) is based on a system designed in Israel. The Trophy ADS system has three basic elements: Threat Detection and Tracking, Launching and Intercept. Threat detection is provided by sensor, including flat-panel radars, that are deployed so as to provide a fully hemispherical coverage area. Once an incoming threat (like an RPG) is detected and tracked, the Trophy system creates a "beam" of fragments capable of destroying the incoming threat within 10-30 meters of the protected platform. Multiple targets can be engaged simultaneously. General Dynamics plans to introduce the system with every new and existing combat vehicle it produces, including Stryker, M-1A2 and FCS. It can be adapted to US requirements and enter production within two years. The system has completed hundreds of live test exercises with the Israel Defense Forces; Trophy ADS has demonstrated effective neutralization of anti-tank rockets and guided missiles, high safety levels, insignificant residual penetration and minimal collateral damage. Obviously, this system fails to meet the standards for a science-fictional "force field." However, the ability to defend a hemispheric section would probably remind sf fans of David Drake's Hammer's Slammers series, which has a similar device. Earlier mentions of the full-blown force-field idea include the force-field from 'Doc' Smiths 1931 novel Space Hounds of IPC and especially the half-sphere force-field from Robert Heinlein's 1951 novel Between Planets. Read more at Defense-Update and TechBlog. Thanks to Gil for writing with the story tip and references.